Shri Vasishthaji said that what I have heard in ancient times from Lord Brahma about the marriage of Tulasi I will now describe according to what is written in the Narada-pancaratra. First one should plant Tulasi either in the house or the forest, and after three years one may perform her marriage. The auspicious times when one may perform the marriage of Shalagrama and Tulasi are described as follows. When the sun is moving in the north, Jupiter and Venus are rising, in the month of Kartika, from the Ekadashi to the full moon in the month of Magha, and when constellations that are auspicious for marriage appear, especially the full moon day. – First one should arrange a place for sacrifice (yajna-kunda) under a canopy (mandapa). Then after performing shanti-vidhana, one should install sixteen goddesses, and do the shraddha ceremony for his female maternal ancestors. 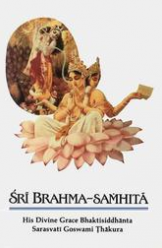 *The author is a well-known Vaishnava Acharya and a Head Priest of the famous Radharaman Mandir in Vrindavana, India.